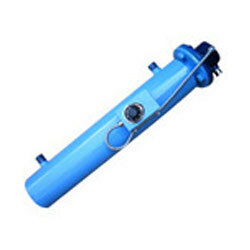 Exporter of a wide range of products which include suction heaters. Suction Heaters are specifically designed to heat only that amount of material that is to be pumped from a large storage tank. The outlet nozzle is attached to the pump suction. The heater heats the material inside the heater pipe body which is then drawn through the heater into the suction side of the pump. This technique saves substantial energy costs since it is not necessary to heat the entire contents of the tank to draw off relatively small amounts of viscous materials. Complete weather-proof construction makes these heaters perfect for installation in large outdoor storage tanks. Large heater inlet provides smooth, full-flow through the heater. Terminal enclosure: circulation heaters are designed to be installed outdoors in exposed areas. Enclosures are designed to be moisture resistant or moisture and explosion resistant. Low watt density elements make the heaters safe to use on most viscous liquids. Carbonization is minimized. Thermostats/ temperature controls and control panels: they are provided with temperature controls to control fluid outlet temperatures and limit internal temperatures under abnormal depending on customer specifications. They may be supplied with factory equipped ar thermostats / temperature sensors in case of digital temperature controllers other panel accessories. Integral or remote mounted control panels with electronic controls and solid state (ssr) or contactor power controllers can be provided using virtually any combination of control devices. Looking for Suction Heaters ?